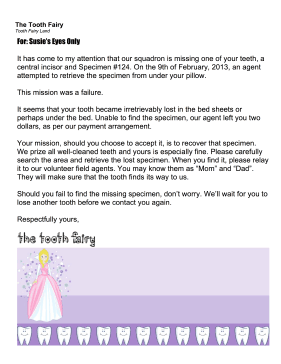 Written as a special agent missive, this printable tooth fairy letter asks a child to find a missing tooth. It has come to my attention that our squadron is missing one of your teeth, a central incisor and Specimen #124. On the 9th of February, 2013, an agent attempted to retrieve the specimen from under your pillow. This mission was a failure. It seems that your tooth became irretrievably lost in the bed sheets or perhaps under the bed. Unable to find the specimen, our agent left you two dollars, as per our payment arrangement. Your mission, should you choose to accept it, is to recover that specimen. We prize all well-cleaned teeth and yours is especially fine. Please carefully search the area and retrieve the lost specimen. When you find it, please relay it to our volunteer field agents. You may know them as "Mom" and "Dad". They will make sure that the tooth finds its way to us. Should you fail to find the missing specimen, don't worry. We'll wait for you to lose another tooth before we contact you again.